Anderson Silva cannot fight again until Jan. 31, 2016. Former UFC middleweight champion Anderson Silva was suspended for one year and fined following a hearing with the Nevada State Athletic Commission on Thursday after testing positive for banned substances surrounding his Jan. 31 fight against Nick Diaz. Silva was also fined and the result of his fight against Diaz was overturned to a no contest. The two-hour-plus hearing saw Silva and his attorney make their defense while claiming that the fighter took a tainted sexual-enhancement drug, which then caused a positive test result. Silva tested positive for Drostanolone and Androstane — both classified as banned, performance-enhancing drugs (PEDs) — following a test administered on Jan. 9. Silva also tested positive for Drostanolone again in a post-fight test on Jan. 31 as well as two more drugs — temazepam and oxazepam — that are used for anti-anxiety and sleeplessness. During the hearing, Silva testified and claimed that the tainted supplement was a sexual-enhancement liquid given to him by a friend who purchased the drug in Thailand. Silva stated that the off-market drug similar to Viagra or Cialis was not available for purchase in the United States or Brazil. According to Silva, he knew Marcos Fernandes for approximately one year through training together in Brazil and during a conversation talking about "man stuff," Silva says he received the supplement. Silva said he took the sexual-enhancement drug for about three months prior to the fight. Silva and his defense team called upon Paul Scott, who previously worked with the UCLA laboratory and also testified in cases involving Lance Armstrong and Floyd Landis. Scott claimed that he performed tests on the fighter’s supplements and that’s where he found the tainted substance that he believes caused the positive result. Unfortunately, Scott didn’t bring any documentation with him to the hearing to provide proof of the testing or the results to show the commission. "I’m human and I make mistakes and I made a mistake," Silva said during the hearing. The commission grilled Silva and his defense about the dates he claims to have taken the drug. Meanwhile, Dr. Daniel Eichner from the Sports Medicine Research and Testing Laboratory testified that any use of Drostonalone would only show up in a result if taken within about a week of the testing. Silva also claimed during the testimony that prior to his bout at UFC 183 he had never been subject to enhanced drug testing. Previously, Silva said he was only tested on fight nights. 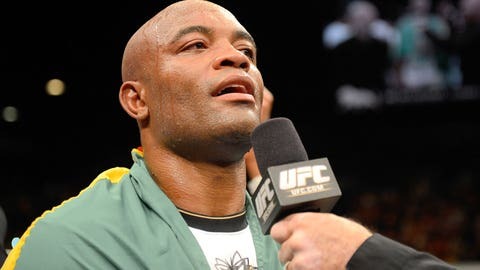 As the commission began deliberating, Silva was accused of showing no remorse for the positive test or offering an admission of guilt for using banned substances. "Given the testimony we heard today it’s quite evident there are some major inconsistencies in what I’ve heard and the testimony I’ve heard. For that reason, I would actually proceed with going on the higher end for a penalty," Nevada State Athletic Commission chairman Francisco Aguilar said about Silva. "I think there’s been very similar instances where we’ve had these types of situations, and when the fighter does come forward and is consistent in his testimony and takes some responsibility and shows some remorse — but I don’t think that exists today." The one-year suspension is retroactive to the date of Silva’s fight — Jan. 31 — which means he will be eligible to return on Jan. 31, 2016. The commission also fined Silva his $200,000 win bonus as well as 30 percent of his fight purse of $600,000, which equals out to another $180,000. Silva will also have to provide a clean drug test before being re-licensed in the state of Nevada.